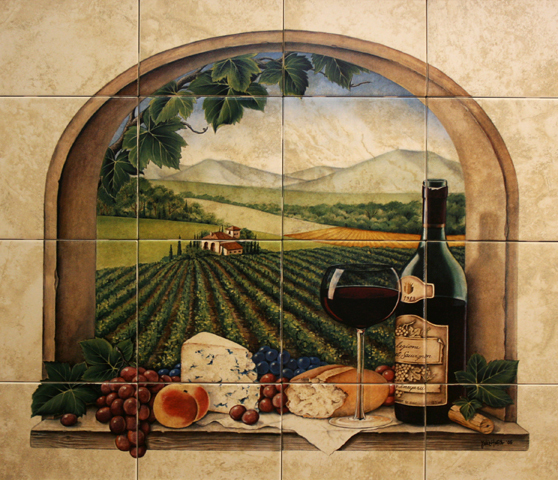 "Taylor's Vineyard" is a beautiful decorative ceramic tile mural depicting a vineyard in the Italian Tuscany countryside through an arched open window. Grapes, wine and cheese are arranged in the foreground on the window sill. In the intermediate distance is a Tuscan villa in a rolling agricultural landscape with distant hills as a final backdrop. Coordinated accent tiles depict grapes, other fruit, grape leaves and vines. This is a medium sized mural suitable for installation behind a stove as a backsplash, in the shower, over the tub, on a wall or behind the barbecue. The artwork is a limited reproduction of an original painted by tile artist, Julie Hatch, in her Southern California Studio. Julie has been creating Ceramic tile murals for her clients since 1984.